The vulnerability of atheromatous plaques in the carotid artery may be related to several factors, the most important being the degree of severity of the endoluminal stenosis and the thickness of the fibrous cap. It has recently been shown that the plaque length can also affect the mechanical response significantly. However, in their study on the effect of the plaque length, the authors did not consider the variations of the plaque morphology and the shape irregularities that may exist independently of the plaque length. These aspects are developed in this paper. 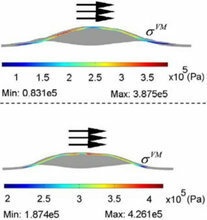 The mechanical interactions between the blood flow and an atheromatous plaque are studied through a numerical model considering fluid–structure interaction. The simulation is achieved using the arbitrary Lagrangian–Eulerian scheme in the COMSOL TM commercial finite element package. The stenosis severity and the plaque length are, respectively, set to 45% and 15 mm. Different shapes of the stenosis are modelled, considering irregularities made of several bumps over the plaque. The resulting flow patterns, wall shear stresses, plaque deformations and stresses in the fibrous cap reveal that the effects of the blood flow are amplified if the slope upstream stenosis is steep or if the plaque morphology is irregular with bumps. More specifically, the maximum stress in the fibrous cap is 50% larger for a steep slope than for a gentle slope. These results offer new perspectives for considering the shape of plaques in the evaluation of the vulnerability.